With years of experience in the industry and vast knowledge across an array of sectors, we can provide you with high quality solutions to boost your marketing efforts. We specialise in the design and manufacturing of display and exhibition stands to use at events, trade shows and in retail environments. Our expertise means we can give you all the information you need in an easy to understand way so you can then make an informed decision on which stand or display is right for you. Promote your business perfectly with our extensive range of striking and detailed banner stands, display stands, exhibition stands, promotional flags, pavement signs and much more. With so many types of solutions to choose from, it can be a challenging process but we aim to simplify the experience for you. We understand the individual needs of businesses and we cater to any specific requirements. We can help you design a unique, bespoke display and all of our exhibition solutions are made to the utmost standards. We supply to a multitude of end users including museums, retailers, hotels, leisure providers, charities and education establishments so whatever your needs, we can help. As display and exhibition professionals, we can help you advertise your product or service in the most effective way possible. We strive to deliver high quality products that are also affordable; and our personal customer service is second-to-none. We offer wide range of Literature Floor Stands Free Standing Lectern. 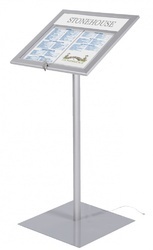 Floor standing lecturn has a clear acrylic book rest mounted on an aluminum pole with a neat stable base. Can be assembled with or without the supplied ring binder. Without the rings you get an inclined top table on which to place notes when addressing your conference audience. Low cost yet effective menu browser, catalogue stand and acrylic lectern combined. With the supplied ring binderthis makes a catalogue display stand for use in shops, showrooms and similar locations. Fits A4 size paper punched with 4 holes. In a restaurant it makes a portable menu display stand which can be placed on the floor at the entrance. In a meeting room, training room or seminar room the lectern provides the perfect place for your notes. It can be assembled without the ring binder if you need a flat (but inclined) surface on which to place your notes. The lower lip keeps papers or prompt cards safe and secure. Top is made from clear acrylic and the lectern stand is made from silver finish aluminium. It is stable yet portable - easy to pick up and move. Personalise your lectern by adding a brochure holder or front-facing snap frame to brand your catalogue stand or identify the speaker at a meeting. 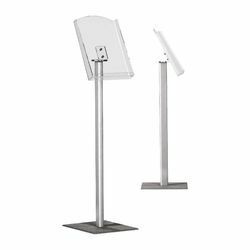 Click here for Presenta Information Point accessories which are compatible with this Lectern stand. This illuminated floor sign will display an A4 poster on a poster stand. You can use this illuminated poster holder to display any A4 graphic within your store, or alternatively, you can place it out the front of your premises to attract more customers inside. Lit with LED’s, this free standing illuminated sign will brightly light your posters and menus, but will give you a longer lasting illumination due to the fact that LED’s have a longer life. We offer wide range of Acrylic Brochure Stand. Suitable for displaying your brochures in public areas like Kiosk, hotels, showrooms, shops and exhibition areas. Packed unassembled with an easy assembly sheet in its box. A4 or 2xA4 models available. Poster stand for indoor use. Modular budget display pole system. Steel spun base with slotted aluminium display pole and end cap. Pole is normally 1800mm tall. Pole can be fitted with snap frames, lockable frames, edge lit light boxes, brochure holders and/ or banner rails. Looking for Display Stand and Accessories ?